`Samsung is the world's biggest smartphone manufacturer. While their success is of course driven in part by their awesome flagship phones such as the Galaxy Note 8 and the Galaxy S9, Samsung is also very, very good at releasing high-spec phones at a lower price point. If this appeals to you, read on, and find out more about the impressive Samsung Galaxy A8. You won't be disappointed. With the release of the Galaxy A8, Samsung brings some of our favourite flagship features - such as the Infinity Display and Dual Front Camera with Live Focus - to the Galaxy A series. And of course, the phone retains the good looks and style of its A series family members. Whether your taste is bold or classic, the Galaxy A8, with its smooth curves and comfortable, ergonomic grip, is a beautiful and stylish phone you won't want to put down. Thanks to the 18.5.9 Infinity Display (the largest display for a Galaxy A phone to date) you'll feel fully immersed in what's on screen at all times. The A8 offers a wide, horizontal view, providing a stunning cinematic experience for crisp, clear and easy-to-read images. The larger Infinity Display allows for more reading and browsing, with less scrolling. Whether checking the news or emails, or updating a spreadsheet on the fly, the large display is sure to meet your business requirements. Another feature you'll love on a busy day is the Always On display that means you can check your phone without going to the hassle of unlocking it. The screen is always available and contains important information like date, time, notifications and even battery level. Taking stunning photos on the Galaxy A8 is as easy as tapping the shutter. The main rear camera is an impressive 16MP, but the front camera is where it gets exciting. In fact, the A8 has a Dual Front Camera - one camera of 16MP and one of 8MP. Using the clever Live Focus feature, you can choose to have your background crisp or blurry, altering the look and mood of every snap. Once you've used the high-tech camera to take a whole lot of photos, you'll need the new gallery search bar to find the one you want. As you search, the gallery analyzes your photos and pulls out relevant pictures, even displaying them by category. Keep your day on track, set reminders and get information via your camera with Bixby. Bixby is a virtual assistant that works via text and touch and learns your habits. With Bixby Home, Bixby Vision, and Bixby Reminder, it integrates seamlessly into not just the Galaxy A8 but also your lifestyle and day-to-day activities. Read more about Bixby here. Offering IP68 water and dust resistance, the Galaxy A8 can withstand the elements, including sweat, rain, sand and dust, making it suitable for nearly any activity or situation. The Galaxy A8 supports microSD cards so you can expand your storage capacity by as much as 400GB, and is the first in the A series to support Samsung’s Gear VR. You've read enough - now buy the Samsung Galaxy A8 from Vodacom Business Online here, and get free delivery, free SIM and free connection. 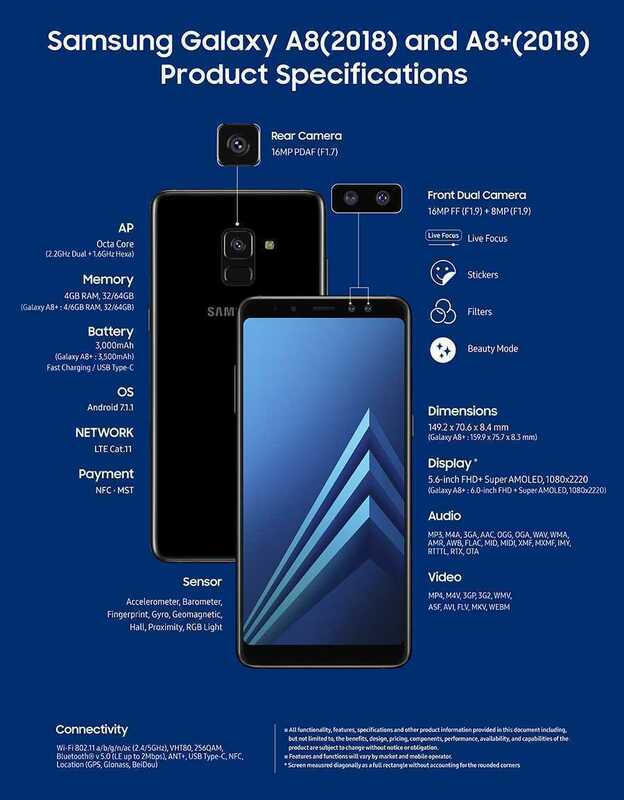 With the release of the Galaxy A8, Samsung is bringing their customers’ favourite features from their flagship smartphones to the Galaxy A series.